I read the passage out loud, but no one was interested, so I relapsed into nerdy silence. Years later I found that the now accepted theory is that fish in shallow waters, accustomed to using their fins against the sea bottom, began to use them to navigate mud flats at low tide as mud skippers still do in mangrove swamps today. Legs evolved from fins. On the planet Cyan, hundreds of millions of years ago, primitive chordates developed a split vertebral column, which resulted in twin tails. When they moved onto land, their tiny front steering fins were never used for locomotion and their twin tails (they had no back fins) became legs. Look, no pelvis. Look at this complex of bones. Some are fused, some flex, and these four are cantilevered. And look up here; no scapulae, just three extra thick, specialized vertebrae. Tiny front legs, powerful back legs with twice as many joints as you would expect, and absolutely no hint of a tail. Not even anything like a coccyx. A truly tailless, truly hopping biped. I wouldn’t have believed such a thing was possible. Not a frog, not a kangaroo. 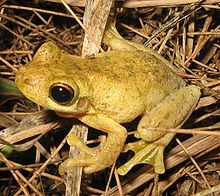 Frogs are quadrupeds with overdeveloped hind legs, like rabbits. They have a vestigial tail, like a human coccyx. If you look at a frog’s skeleton, it looks a bit like a massively deformed human. They can leap, but they also walk. 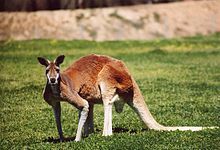 Kangaroos have a five-legged gait when walking. They lift up on a tripod made of small front legs and a powerful tail to shift their massive hind legs forward. Then they stand balanced on their hind legs while moving their forelegs and tail forward. 3 – 2 – 3 – 2, etc. When they run, they depend on their tail for balance, just as some dinosaurs used a massive tail to keep their foreparts from tipping forward. Cyanian bipeds, from the simplest to the most complex are hoppers. They all have short, grasping forelimbs; not quite T-rex hands, perhaps, but too weak to knuckle walk, as apes do. They can move miles with grace and speed, but moving inches puts them into a condition of stumbling clumsiness. There are tree dwelling tailless bipeds on Cyan; how they navigate is a mystery I didn’t get around to investigating. 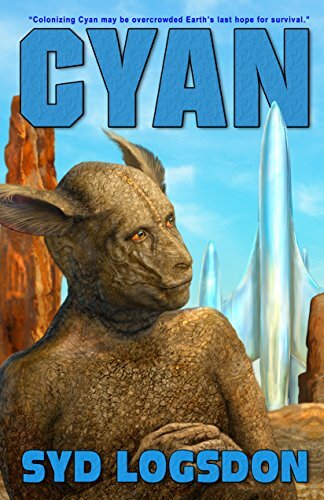 When a trio of Cyl (intelligent Cyanian creatures created through recombinant DNA – its a long story) first enter a human habitat . . . They were awkward inside the dome where the furnishings of the place made a maze for them to negotiate. As bounders, they were creatures of the unobstructed open plain. This human habitation was utterly foreign to them, not because of the steel from which it was made, or the interlocking triangles of its geodesic construction, but because it was cluttered. How could one hope to move about in it? I explained all this to the artist who did the cover for Cyan. I also sent a crude sketch of what I had in mind, with many disclaimers about my (non)skills as an artist. The resulting cover shows a Cyl slightly different from my vision, but better. That’s what good SF cover artists do. However, it is an upper body portrait, so the secret of bipedal tailless hopping remains unresolved. If I really want to know how it works – and I do – I would have to construct a skeletal robot and see how he moves. But there is no way I’m going to have that much free time anywhere in my near future. I have too many other books to write. This entry was posted in A Writing Life and tagged Cyan, ecology, science fiction, writing on April 3, 2017 by sydlogsdon.